Fall Is Not Easy by Marty Kelley is classic and tells the story of a tree's struggle to get it's fall colors right. The text is very straight and simple, but the illustrations are hilarious and unexpected as the tree tries to change colors, but ends up with crazy patterns and designs. The Busy Little Squirrel by Nancy Tafuri shows a little squirrel busily scurrying around gathering food to store for winter and has a repeating line the kids will enjoy saying. Leaves by David Ezra Stein tells of a little bear cub experiencing his first fall and his confusion and concern about the falling leaves, which he tries to put back on the trees. When The Leaf Blew In by Steve Metzger is a funny little cause-and-effect story that starts with a simple leaf blown into the barn by the wind. The kids can name the animals and the actions, add animal sounds if you like. Mouse's First Fall by Lauren Thompson shows Mouse and Minka observing and playing in the autumn leaves. Children can try to find Minka, hiding in the leaf pile. Fall Leaves Fall by Zoe Hall is a nice, basic book about fall leaves and shows the different colors and shapes and names of various leaves. Oliver Finds His Way by Phyllis Root is not so much about fall as set during fall, as little Oliver begins chasing a windblown leaf and gets lost. But eventually his parents hear his "Roar!" and find him. Kids will enjoy roaring with Oliver, and the story offers a lesson in not wandering off, but also the best thing to do if you do find yourself lost. Penguin and Pumpkin by Salina Yoon has Penguin and friends returning to a warmer clime in order to experience fall, but Penguin's little brother Pumpkin is too young to go. How can Penguin help Pumpkin to know what fall is really like? It's Pumpkin Time! by Zoe Hall shows the life cycle of a pumpkin, from planting the seed to carving the jack-o'lantern with charming illustrations. We also had a leaf-sorting activity, which is a great pre-math skill. We had a bunch of foam leaves with magnets on the back, of varying shape, color, thickness, some sparkly, some not, so there were several different characteristics to sort by, and the difficulty and complexity could be adjust for each group. Each child was given two leaves to place on the board in the appropriate group, and older children were asked to explain their choices. At the end we would count and discuss which categories had the most, and more than, less than. And the final activity was to act out a pretend trip to the farm where we picked apples and pumpkins, helped rake leaves, and sample apple pie. I like this activity because you don't have to have an exact script and can just make it up as you go along. This is a good one to do if you have a wiggly group that needs to work off some energy. My personal favorite of the books we used was Fall Is Not Easy, and the kids all liked it as well. The Busy Little Squirrel is very short and simple, but the kids really seemed to enjoy saying "he was too busy" each time. Oliver Finds His Way was also a favorite; hello, it has roaring, after all. I like the opportunity it presented to discuss the importance of not wandering off in the first place, but also what to do if you do get lost (stay put & yell!). Penguin and Pumpkin was the perfect book for the daycare we visited today as they are having people from the aquarium come to talk to them about penguins tomorrow. The other books were all fairly well-received, too, but not many really stood out this time. Today we had several groups that were really squirrely and having trouble settling down, so we ended up spending more time re-directing and re-focusing and didn't get to read as many stories. I think the change in the weather and the recent blood moon had something to do with it. In case you're wondering why there weren't any books on apples, we did a whole theme just on apples the week prior. I'm really looking forward to the next theme, "Monsters". 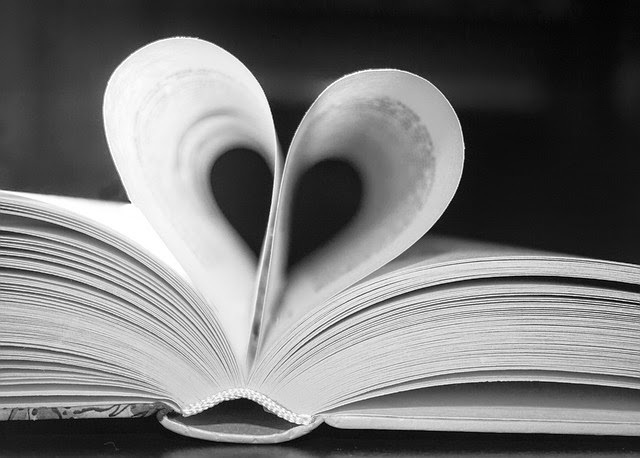 We have some great books for that and it should be a lot of fun! 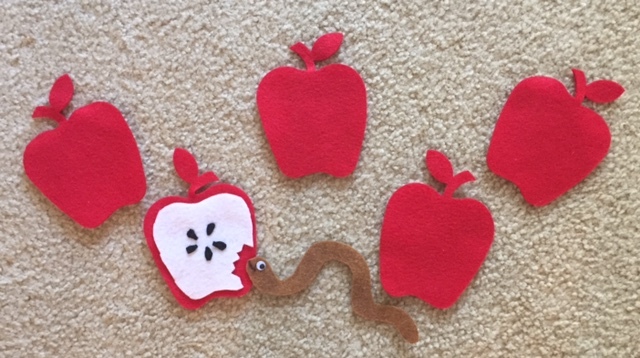 Since one of the apple books turned out to be such a big hit on the storytime bus, and I enjoyed reading it, I decided to go ahead and use the same theme with my regular preschool storytime I do on my own. There was also another book we had tried on the bus that was kind of hit and miss, and I wanted to try it one more time before deciding whether to include it in the "Apple" kit for the future, or not. As always, we started with our "welcome song", which the kids asked to sing again. This group *really* likes that song for some reason. Then I introduced our topic of apples, and showed them several different varieties of apples and the star inside. Next, I decided to add a theme-related rhyme with movement before moving on to our "story song" to see if stretching out the beginning would help them settle down more by the time we got to the story. 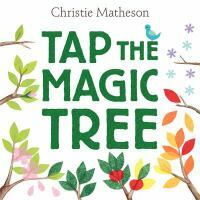 For our first story I chose Tap The Magic Tree by Christie Matheson. This is a very interactive book that I first pulled to try out on the Storytime Bus. It asks the reader to do various motions, tap the tree, knock on the trunk, blow a kiss, etc., to help the magic along. The "magic" of course is the changes that take place throughout the year. It shows the seasons in a very fun way. I knew it would be a great lap read, but wasn't sure how it would be for a group read, but it worked really well on the bus and I had a lot of fun doing it, so wanted to use it with "my" kids (I've been doing this group on my own since long before I had the Storytime Bus gig). I just tell the kids to put their hand up and do the motions in the air, while I actually touch the book (if you had a small enough group you could let each child come up and do one of the actions with the book). Ate that apple right out of the tree! Because he ate all the apples from the apple tree! The second story I read was one I tried on the bus with mixed results; sometimes it worked and sometimes it didn't. The story is really cute, as Little Mouse finds an apple he doesn't want to share, so he decides to hide it by burying it. He is determined to keep his secret, all the while not realizing his secret is revealing itself as the seeds sprout and grow into a tree. In the end, he finds that some secrets are better shared. Great story, and repeating lines the kids can say along with you, BUT the illustrations are really, really small. So I wanted to give it one more try before deciding whether to order a copy for the bus or not. I had brought another book, Ned's New Home by Kevin Tseng in case they were ready for 3 books, but it was obvious 2 is still all they can handle for now, so we went on to our closing song, and I passed out apple stickers. They did pretty well today, but it will still be a while before we work up to three books I think, though they are showing improvement each time. The really liked Tap The Magic Tree and were very attentive for the most part, and loved the "Five Little Apples" rhyme, especially the big "CHOMP!" with the loud clap and giggled every time. Poor Little Mouse's Big Secret didn't fare so well. A few paid attention, but I lost most of them. It's a shame, because it's a really cute story and I'm sure if the illustrations were bigger it would be a great storytime book, but they are just to small for the kids to see well. Maybe re-invent it as a felt board story? They were all really excited to see me, and several of them already remember my name. The one little girl was still talking about the Little Lost Cowboy book from a month ago, kept asking for "Coyote, coyote!" I just might have to find a away to get her a copy. This group really likes to sing, so I've got to remember to plan more songs next time! These are some new picture books we just got in at the library, though some have already been out for a month or so. All For A Dime! by Will Hillenbrand, July 30, 2015. Holiday House, 32 pages, ages 4-7. Bear and Mole are all set for Market Day; Bear has picked blueberries and Mole has collected worms. When they stop to give their friend Skunk some of the berries, she decides to join them and sell her perfume. But while Bear has no problem selling his blueberries, Mole and Skunk don't fare so well. It's Will Hillenbrand, so of course the illustrations are adorably charming. 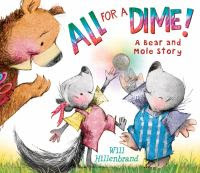 The story is cute and humorous, and is a good first lesson in supply and demand, though some of it may need to be pointed out to younger kids, like the fact that Mole and Skunk just end up passing the same dime back and forth, so it would be good to ask questions and have a little discussion about what happened after reading. 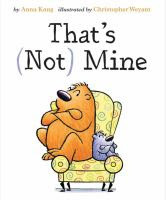 That's (Not) Mine by Anna Kang, illustrated by Christopher Weyant, September 1, 2015. Two Lions, 32 pages. Ages 3-7. Two "fuzzy creatures" (I thought they were bears) are arguing over the big comfy chair: "I was sitting there" "I had it first" "It's mine", etc. They keep arguing and trying to trick each other out of the chair, and end up crashing into the floor. They make up and decide to go out and play instead, but as it turns out someone else was interested in the chair, too. As a parent and youth services worker I could totally relate to the argument and found this book quite humorous in it's simplicity. Any parent will relate, and I'm sure many kid, especially older ones, will be able to recognize themselves in the story. This is some good, simple, silly fun with a subtle message about sharing and taking turns that can be discussed at the end. The illustrations are perfect for a read-aloud as well: cute, simple, with bold outlines. 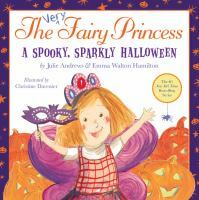 The Very Fairy Princess: A Spooky, Sparkly Halloween by Julie Andrews and Emma Walton Hamilton, illustrated by Christine Davenier; July 21, 2015 (first printing April 1, 2015). Little, Brown Books for Young Readers, 32 pages. Ages 3-7. Gerry is looking for the perfect Halloween costume for the school parade; after all, a fairy princess is who she is, not a costume! She finally comes up with one that works with her fairy identity beautifully and she is excited for the party and parade. But when the day comes, an accident ruins her best friend's costume. Will Gerry's unselfish quick thinking save the day? I have to confess, I have never read any of the Very Fairy Princess books before, but I'm a Julie Andrews fan so I was hoping it would be good, despite my usual disdain for celebrity children's books. Although there are a ton of cute Halloween books, this one is a nice alternative if you're looking for something not having to do with ghosts, goblins, and witches, and of course someone who is already a Very Fairy Princess fan will love it. It is a cute story, with some clever and humorous lines, and I like that it shows the dad baking muffins and a male teacher. It's a little long, so probably better for one-on-one or for older kids as a group read-aloud. 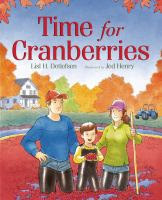 Time For Cranberries by Lisl H. Detlesen, illustrated by Jed Henry; September 1, 2015. Roaring Brook Press, 32 pages. Ages 3-7 [I would say more like 5-8]. Follow Sam as he gets to help with the cranberry harvest on his family's farm for the first time. This instructive story follows the harvest step-by-step, from the flooding of the bogs down to the baking of a cranberry pie (recipe included). This story is inspired by the author's life on a Wisconsin cranberry farm. I was excited to see this book initially, glad to have something new for the fall harvest theme. There are lots of books on picking apples and pumpkins, and a couple on corn, but this is the first time I've seen one about cranberries. I was hoping it would be a good storytime addition. But, when I opened it I was disappointed. There is way too much text, and I would like the illustrations to be just a bit more simple with bolder outlines and colors; it is just a little too long and detailed to work as a preschool storytime book. But, it is still interesting and something kids have probably never learned about before, and would be good as a class read for older kids or as a one-on-one with younger kids. It might work better if the adult read it first and paraphrased some the longer passages. Tap The Magic Tree by Christie Matheson is a very cute interactive book that shows how the tree changes during the seasons, and starts anew in the spring. At first I wasn't sure how this would work as a group read-aloud, but it worked well. Ned's New Home by Kevin Tseng is one of the few apple books that truly has a story, and is about a little green worm named Ned who has a perfect little home in an apple. Until it starts to rot, that is. To make it more interactive, let the kids name each fruit Ned tries out for his new home, and explain why his friends couldn't find him in the kiwi. I Am An Apple by Jean Marzollo has charming illustrations and follows the growth of an apple from bud to harvest, and has a nice, simple illustration at the end of the life cycle of the apple. We had a big book version of this one. 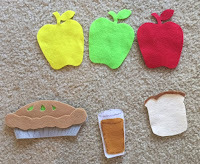 The Apple Pie Tree by Zoe Hall, another book that not only shows how the apple tree changes through the seasons, but culminates in baking apple pie. I like how this one also shows the development of the robins from eggs to adults as well, and shows the kids playing outside in seasonal clothing to give more context to what's going on with the tree. Ten Red Apples by Pat Hutchins shows the farmer's animals eating his apples one by one, and each time he exclaims "Yippee, fiddle-dee-dee" and "Save some for me". This is a very interactive book that calls for lots of audience participation, with number recognition, counting, naming animals and making their sounds, and saying the farmers' repeating lines along with the reader. 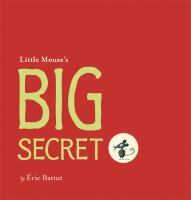 Little Mouse's BIG Secret by Eric Battut is a very cute story about a mouse who finds an apple and buries it in the ground to keep it a secret. But of course, as time passes his secret reveals itself! I love the story, the repeating line of "It's my secret, and I'll never tell", and the lesson in sharing, but the illustrations are soo tiny the kids have trouble following what's happening at first. Orange, Pear, Apple, Bear by Emily Gravett is a cute book with only 5 words. I like this one, but I don't think the kids really quite get it, though a few do and some recognize the rhyming words, pear and bear. Apple Farmer Annie by Monica Wellington shows the process in growing and harvesting apples, making different goods with them, then transporting them to market and selling them. The book is rather small and a little too much information to hold most kids' attention very well. Apples by Gail Gibbons is a non-fiction book that has way too much text and detailed illustrations to be a good storytime book, but it does have 3 pages showing different varieties of apples that are good to show and talk about. Ate that apple right out of the tree. 'Cause he ate all the apples from the apple tree! I also made felt pieces to go with it (using an Ellison die for the apples), inspired by Storytime Katie. Each time the worm went "CRUNCH", I turned the apple over to show the inside with the bite out of it, and moved it to the bottom. And "Apple" is it's name-oh. (Repeat, each time replacing a letter with a clap) I used my felt apples for this as well, along with cut-out letters. Give us pie and juice and bread. And felt pieces for this one, too (I was feeling crafty). I just freehanded quick templates for these, but didn't think to save them. I'm not happy with the apple "bread", so I'll have to figure out a better one. Although it went pretty well, and I was inspired to be crafty and make several felt pieces, I have to admit I wasn't as enthusiastic about this theme as I'd like, and I'm not sure why. I think partly because I only really enjoyed one of the books, Tap The Magic Tree. The others were okay, but just okay. Also, on one of the days the volunteer working and I just didn't seem to be quite on the same page. I would say the big winner of the books was definitely Tap The Magic Tree by Christie Matheson. I loved the way this told the story of how an apple tree changes each season, and having the interactive component of being directed to do various actions to help the magic along. I knew this would be an awesome one-on-one read, but was a little concerned about how it would work with a group, but the kids loved it! The younger the group, the more impressed they were with the "magic" and some asked to read it again. Ten Red Apples also gets big points for audience participation, and The Apple Pie Tree scores in having a title that gets the audience's attention, and giving extra context to the seasons. The other books were all somewhat well received, with the exception of Apple Farmer Annie. I really wanted Little Mouse's BIG Secret to work well, but the illustrations really need to be bigger, and it needed to be more obvious that the mouse was burying the apple in the ground to hide it. Since we talked about cowboys last time, I thought it was only fitting that we should follow that up with horses this week. 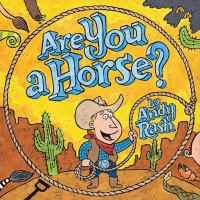 That, plus I really wanted to do Are You A Horse? I am still sticking with a shorter storytime and only two books for this group, since they are mostly on the younger side of 3 and are having a little trouble settling in to the routine, not just for storytime, but in general according to the teacher. They aren't bad, but just have excess wiggly energy and like to talk. "I Gave My Horse An Apple"
And we rode for half a mile! Slap hands on thighs to imitate horse trotting. Repeat several times, getting faster each time. Then, we ended with our usual closing song and horse stamps. I had the largest group I've ever had there today, 16 kids, and they were pretty hyped up. I like their enthusiasm and excitement, but we still need to work on reining it in a little bit (ha, get it, reining ☺). They did not listen as well as I would have liked, and just couldn't seem to settle down. I had even added more verses to our story song than usual, and had them stretch and shake their sillies out. In retrospect, I might should have done the "Giddy-Up" song earlier and for enough verses to tire them out! Part of the problem is the classroom. It is too small and overcrowded and does not have a good place for the kids to sit in a nice 2-row semi-circle. Instead they are over-crowded into several cramped rows, so they can't all see well, and when they are in the back it is hard to keep them engaged. I'm not sure what I can do about that, but I will try a different seating arrangement next time. The ones that listened seem to really like the stories. 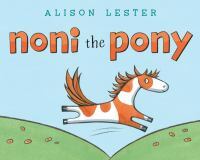 They thought Noni the Pony was cute and sweet, and a good friend, and that Roy was very silly in not knowing what a horse was! At the end it took some of them a while to register what was wrong about the picture, but once they did they all though it was hysterical. This group definitely seems to like songs better than rhymes, so I will have to keep that in mind, and try to thing of ways for them to have more movement in such a cramped space without anyone being hurt. Once again I noticed the teacher following up storytime with a coloring sheet related to the theme. I think I will start providing some for her so she isn't having to scramble around at the last minute. I was impressed with how much one little girl, who happens to have Down's syndrome, remembered from last time. She was the only one in the group who remembered what our previous theme was, and evidently was really taken with the Lost Little Cowboy. When I asked if anybody remembered what we talked about last week, she kept saying "Coyote, coyote" over and over, and when I acknowledged her, she then said "Moon, moon!". She really liked the part about him howling at the moon. It's nice to see when a book really makes a lasting impression on a child like that. She kept asking for "More stories, more stories". I also noticed she was hesitant to get in line to get a stamp. She wears leg braces and walking seems a bit awkward for her, so I think she was wary of getting in the middle of the mob for fear of accidentally getting knocked off balance. I was mindful that she was off to the side and was going to be sure she got a stamp, but I thought it was very sweet that the kids kept reminding me that she needed one. I love to see when kids help each other and look out for each other like that. Doggone Dogs! by Karen Beaumont is a little on the longer side, but very funny as a pack of dogs get into all kinds of trouble. Note: there is a mention of poop. Mouse Count by Ellen Stoll Walsh shows our heroic mice one again, this time outsmarting a snake who plans to have them for his dinner. Russell the Sheep by Rob Scotton is about a poor little sheep who can't get to sleep. Ten Dirty Pigs by Carol Roth is a reversible book. One side shows the dirty pigs one by one getting into the tub, the second part shows the 10 now clean pigs getting out of the bath and getting dressed, only to get dirty all over again. One Blue Fish by Charles Reasoner is a lift-the-flap counting book that also shows colors, a good tie-in to last week's theme, and good for younger kids. 1, 2, 3 To The Zoo by Eric Carle counts up to 10 by showing train cars full of animals on their way to their new home in the zoo. 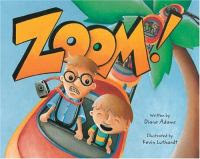 Charming illustrations, and the kids enjoy making the appropriate animal sounds/motions. See if they notice the mouse on each page. Soup For One by Ethan Long shows flies coming in the window one by one to enjoy a bowl of soup. Observant kids will spot a sneaky spider lurking about, but the ending has a bit of a twist. Ten Little Apples by Natalia Vasquez is an illustrated version of a classic rhyme about the wind blowing apples down, with a turn-the-dial feature. One To Ten and Back Again by Betty Ann Schwartz is another reversible book with an interesting pull-through ribbon feature I've never seen before. The novelty feature will interest kids, but the pictures on the ribbons are tiny. Count down to Zero, and end with "...because Sally is a horse!" 1 little, 2 little, 3 little bubbles. 4 little, 5 little, 6 little bubbles. 7 little, 8 little, 9 little bubbles. 10 little bubbles to pop! Pop, pop, pop, pop, pop those bubbles. Show fingers to count, then clap to pretend to pop bubbles, or use real bubbles. "Five Elephants In The Bathtub"
Count up to five, and end with "...and they all fell in!" Hidden away, where nobody sees. I used my finger puppet glove I made using printables from Leah at Sunflower Storytime, while my partner showed the kids how to do the hand/finger motions. 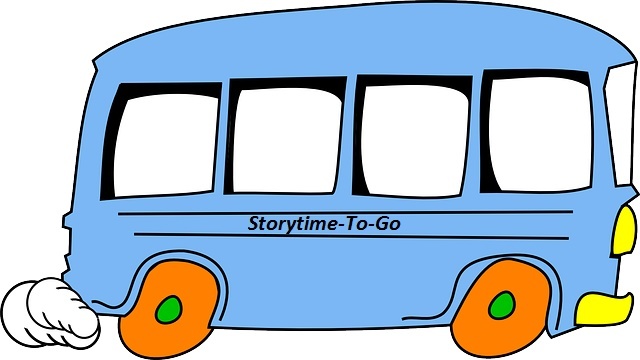 We also did additional activities such as counting all the people on the bus, then comparing children versus adults, boys versus girls, various items; estimating how many hands tall they were, then measuring (we are in horse country, after all), pointing out the different numbers on the walls, etc. To be honest, this was my least favorite storytime theme of all time. With the exception of colors, I generally find strict concept-based themes to be too boring and monotonous anyway, but especially this one. I wasn't too pleased with the selection of books in the kit. They were okay individually, but they were almost all counting books with no real story, so as a collection it was just too repetitive and too much of the same things. I tried to find some books with more of a story, but didn't have much luck. The first day of the theme was the worst; only one of the 5 classes we had showed much interest or engagement. However, the rest of the week was a little better and some of the books did well with other groups. They loved the hijinks of the dogs in Doggone Dogs!, and of course the mention of poop is always a hit with the boys in particular. Russell the Sheep was also well received, as was Mouse Count and 1, 2, 3 To The Zoo. One Blue Fish also fared pretty well, even with the older kids. The remaining books we used were okay, but did not induce as much enthusiasm. Soup For One was hit and miss, with some groups being very observant and noticing the sneaky spider right away and appreciating the humor, but others completely missed it and therefore found the story boring. Of the activities, "Sally the Camel" was a big miss. I was told it was always a big hit and kids loved it, so I had to try it. Well, they didn't mind singing it, but NO ONE got the joke, except for the teachers, and a number of kids didn't even know what a camel was. No laughs at all, I could hear the crickets chirping. So after the first day I searched for some more fun songs with actions. The "Ten Little Bubbles" song was a hit, and would be even more fun if you had enough room to use real bubbles, and the "Beehive" rhyme is so short and simple, but the kids always love it when you have the finger-puppets to "buzz" them all with; lots of giggles and requests to repeat for both of them. Of course there are any number of "5 Little..." and "10 Little..." rhymes and songs that you could use as well. Adding the various counting, sorting, grouping and comparing more or less than activities break up the monotony and keep the kids involved as well. If you want to try doing a numbers/counting theme, I strongly recommend you develop it more as a STEM-type program, rather than a traditional storytime, with fewer books and more activities. Personally, I'd rather simply include counting books here and there in other themes rather than do a whole storytime on counting.